WASHINGTON (Oct. 23, 2015) -- "He exemplifies leadership through heart and mind, through logic and strength and civility. Throughout a consequential career, he's earned a reputation for examining problems - and devising solutions - in innovative ways, and in doing so, has broadened our national security perspective, and helped to get our Army to the right place." 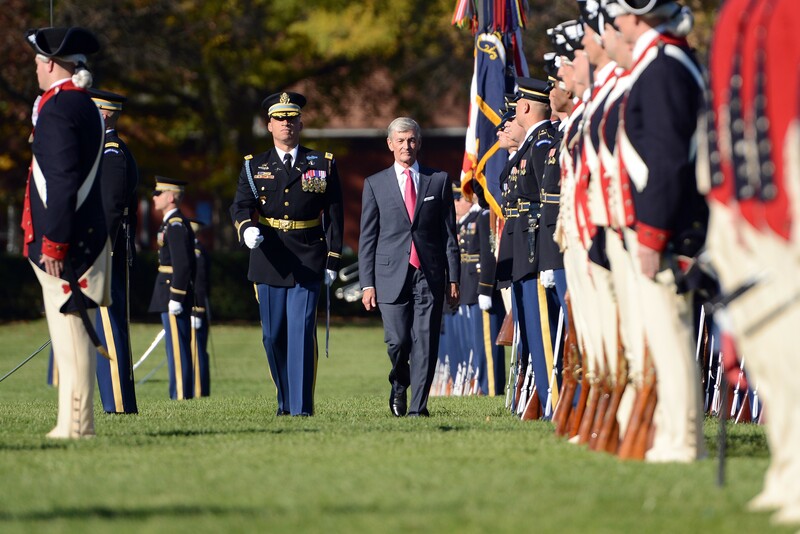 Defense Secretary Ashton B. Carter delivered remarks, Oct. 23, on Joint Base Myer-Henderson Hall, near the Pentagon, during a farewell tribute to John M. McHugh, the outgoing Army secretary. Army Secretary John M. McHugh and commander of troops, Col. Johnny K. Davis, inspect troops on Joint Base Myer-Henderson Hall, Va., Oct. 23, 2015, during a farewell tribute to McHugh. A former U.S. congressman from New York, McHugh assumed the mantle of 21st secretary of the Army in September 2009, and is on his departure, the second-longest serving Army secretary. As secretary, McHugh had responsibility for all matters related to the Army, including manpower, personnel, reserve affairs, installations, environmental issues, weapons systems and equipment acquisition, communications, and financial management. The Army's budget during his tenure, at its peak, sat at $243 billion. Army manpower now includes more than 1.1 million Soldiers across all three components, and more than 221,000 Army civilians. "As secretary, John offered the Army a steady hand, providing constancy through four secretaries of defense and four Army chiefs," Carter said. "Among many other challenges, John managed the drawdown of our ground forces from two all-in fights, where they performed magnificently. He did so in a way that honored the service and sacrifice they had made, and preserved the strength and readiness of the force. Among the many tough responsibilities of the secretary of the Army, maintaining accountability and integrity is paramount. Over six years, John McHugh has been an exemplary steward." Carter also cited McHugh's efforts as secretary to improve conditions at Arlington National Cemetery in Arlington, Virginia, following concerns about quality of care for the veterans that are buried there. Carter said that McHugh served during a time of great transition for the Army, including a drawdown from two wars and extensive budget cuts. He said McHugh led the Army though those transitions and has helped prepare the Army for an uncertain future. Army Chief of Staff Gen. Mark A. Milley has only served alongside McHugh for about two months now, although the two met much earlier in both of their careers, Milley said. 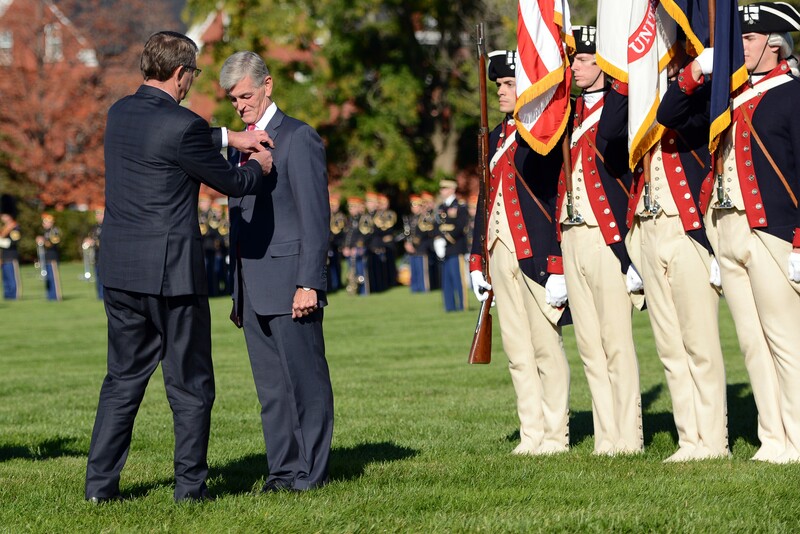 Defense Secretary Ashton B. Carter pins a Distinguished Public Service Medal onto the lapel of Army Secretary John M. McHugh on Joint Base Myer-Henderson Hall, Va., Oct. 23, 2015, during a farewell tribute to McHugh. The general said he first met McHugh when he was himself a major, serving in 10th Mountain Division (light) on Fort Drum, New York, and McHugh had just become a U.S. congressman from New York's 24th District. "He fought hard then for the U.S. Army and specifically the 10th Mountain and for all of the Soldiers and their Families who inhabited the [New York] North Country," Milley said. "He took that fight to here in D.C., and he has done that same fight for over six and a half years. As his fourth chief of staff in little over half a decade, I can tell you that it was John McHugh, perhaps more than any individual, who has brought stability to our Army, in so many ways and in so many difficult times. Milley credited McHugh for leading the Army though declining budgets, for increasing Army efficiency, competence, and adaptability, and for realigning Army force structure. "Your leadership, Mr. Secretary, has assured us that we remain ready, and we remain in fact the most capable army in the world," Milley said. "Most movingly for all of us, I think, is your genuine and deep concern for our troops and their Families. It was our guiding light as you visited our wounded and buried our dead. John McHugh has set and lived the example of a true professional, with incredible integrity and incredible civility, and through it all ... you never failed to champion the Soldiers, the civilians, the Families and the veterans of the U.S. Army. You have been a class-act in every sense of the word." Directing comments initially to Carter, McHugh thanked the secretary for their longtime friendship, and for being there in the Pentagon in various capacities for the duration of his own tenure as secretary of the Army. To Milley, he expressed confidence in the general's ability to lead the Army alongside the nominee to serve as the next Army secretary, Eric Fanning. Fanning now serves as acting undersecretary of the Army. McHugh said that with Milley and Fanning at the helm, the Army has "the right leadership to take on the evolving challenges we see appearing before us. Thank you for being here today, but more importantly, for your decades of service. I look forward to watching you lead with your usual skill, determination, and success." 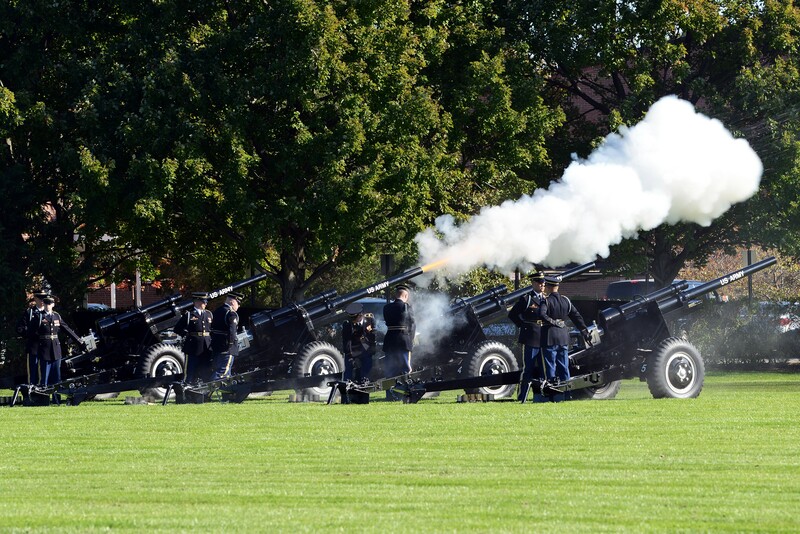 The Presidential Salute Battery fires a 19-gun salute for Army Secretary John M. McHugh on Joint Base Myer-Henderson Hall, Va., Oct. 23, 2015, during a farewell tribute to McHugh. McHugh said when he was sworn in as Army secretary in 2009, the Army was confronting a dangerous world and was engaged in two theaters of war at the same time - but that there existed a "certain sense of stability." He said that at the time, the Army, for the most part, knew who its enemy was. "Beyond those two very dangerous conflicts, few new challenges, at least in the near-term, were thought to be on the horizon." But no more, he said. In the past 20 months, "that stability has largely evaporated - dispersed by new threats and past adversaries." What has also changed, McHugh said, are the resources the Army has to challenge the new uncertainty it faces. He said in 2009, the Army's base and overseas contingency operations budget amounted to about $235 billion. Today, that's at about $150 billion. Coupled with that is a reduction in force. The active-duty Army went from about 553,000 Soldiers in 2009 to about 491,000 today - with more cuts on the way. "There's less money, fewer Soldiers, and more threats," he said. "That's a posture largely unknown in our nation's history, and one that unless something somehow changes, places this Army and indeed the very interests of this nation in a dark and dangerous place. This Army and America were born together, forged from the fires of revolution and steeled through some 240 years of conflict and challenge. Through those times, no matter what this nation has asked, this Army has answered. No matter how steep the climb or how deep the valley, your Army made every necessary effort - always reaching the top, always securing the objective." McHugh called on Congress, the administration, Pentagon leadership, and all Americans to ensure that America's Army can continue to do the jobs they ask it to do. "The people of this nation at large, we all must find a way to do better, because we know should we do even half as well by them - the men, women, Families and civilians of this Army and indeed of all of our nation's services - as they have done for us, America can, American will enjoy another 240 years of life, liberty, and pursuit of happiness," he said. Just more than 1,000 feet from where he stood is the nearest grave in Arlington National Cemetery. McHugh gestured there, to the 250,000 graves, to call attention to "the lives, sacrifices and the incredible and too often overlooked courage of American heroes and American veterans. From battles long past to those still before us, those markers serve as a constant reminder that we owe them so much. "In my now more than six years as secretary, since coming to the Pentagon, I have attended the memorial services at Arlington for dozens of such heroes," McHugh said. "I take no joy in knowing that in the tomorrows that lie ahead, that number will rise. [Of those] so-called ordinary people leaving their so-called ordinary lives, in pursuit of extraordinary purpose, I cannot, indeed I did not improve or add the smallest measure to what they have done. Rather, what I did try to do, what I hope that despite my many failings I did do to some degree, is focus my every effort to ensure that this nation stands by them as they have sacrificed for us. God bless them, America's heroes, God bless America, and God bless this great and glorious Army that keeps us free." The secretary concluded with a simple "goodbye," and then returned to his seat on the podium. He, Carter and Milley finished the afternoon and McHugh's tenure as secretary, by observing a pass and review by members of the 3d U.S. Infantry Regiment (The Old Guard); the United States Army Band, "Pershing's Own;" and the U.S. Army Old Guard Fife and Drum Corps.